The government can wiretap messengers: Whatsapp, iMessage and Viber. Kuku Messenger can not be wiretapped or banned because it does not have a basic server. Today we released a new version, where were added such a functions, like: emoticons, avatars, username and group chats. And the main novelty: now messages are automatically removing on your server to the folder KukuInbox (which the app creates itself), so not to mix Kuku Messages with your regular mail. So now you do not have to create a separate email account for Kuku. - If the message was not sent at the first time due to lack of internet, it will be sent automatically as soon as the network will appear. You do not need to worry about this, unlike other messengers. 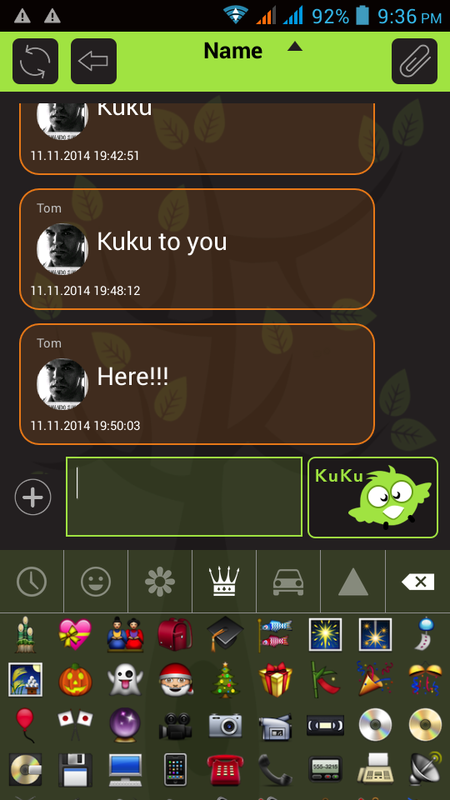 - Long press on the SEND button automatically sends a message "Kuku" just to remind about yourself. - Click on the name of the person will hide it, if you want to make an anonymous screenshot. - Not tied to the SIM card: Use one account in all devices: all messages will be synchronized. If you change the SIM card to the tourist, you need nothing to re-adjust. If you have a tablet without a SIM card, you can also use the messenger Kuku. It is also anonymous, decentralized, free, safe. And at the end of December will be released a version for iOS, and then you will be in touch with all your friends, regardless of their phone model. Download Kuku Messenger to keep the secrecy of correspondence and do not depend on the whims of the authorities.